“Molecular robotics” has been selected as one of the prestigious Grant-in-Aid for Scientific Research on Innovative Areas by the Ministry of Education, Culture, Sports, Science, and Technology, Japan, for the fiscal years 2012-2016. The program consists of four research groups: molecular-sensor group, molecular-intelligence group, amoeba group, and slime mold group. The program started in July, 2012, and is organized by 4 principal investigators, 25 co-investigators, and 33 selected researchers. The main objective of the molecular robotics program is to establish a methodology to construct molecular robots with sensors, information processing circuits, and actuators as well as bodies which distinguish molecular robots from their environments. The action of a molecular robot is autonomously determined by the information processing circuit which controls the actuators according to the signal molecules acquired by the sensors. It should be noted that molecular robots are autonomous molecular systems in which all components are made of molecular devices and switches, just like in living organisms. We focus on technologies for molecular system integration as well as the development of sensors, control circuits, actuators, and bodies. The reason is that the bottom-up self-assembling and self-organization of molecular devices play an important role in the construction of molecular robots. 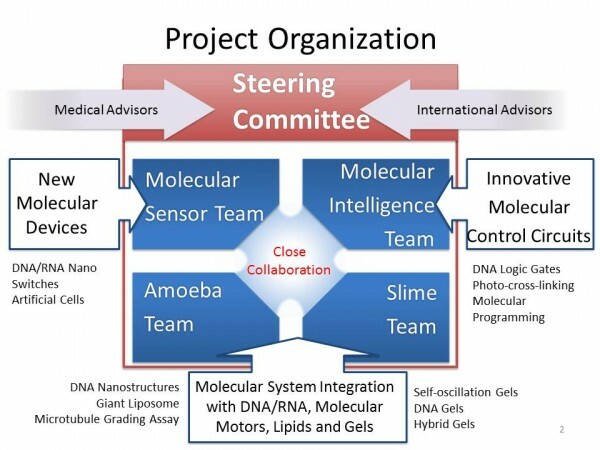 The planned research teams consist of the molecular sensor team (A01), molecular intelligence team (B01), molecular amoeba team (C01) and molecular slime mold team (D01). Both the molecular amoeba team and the slime mold team aim at system integration of prototype molecular robots that make use of the basic technologies developed by the molecular sensor team and the molecular intelligence team. On the other hand, the principal investigators are expected to exploit both fundamental research of elementary technologies and application of molecular robots, thereby complementing the research planned by the individual teams. In order to coordinate the planned research teams and the selected principal investigators, a planning and promotion team was established. 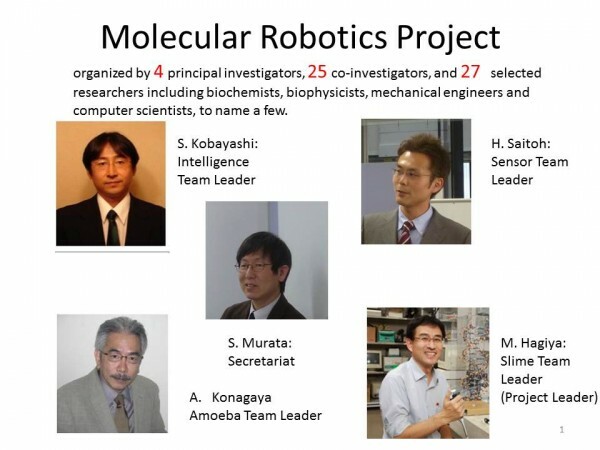 The team also supports the human resource development that is necessary for promoting molecular robotics, especially for younger researchers and students. In order to get more feedback from related scientific areas, we organize symposiums and outreach activities for citizens and high-school students. (1) Mathematical information modelling and numerical simulation of chemical reaction circuits used in molecular robots, (2) design method of reaction circuits which, when the inputs change, the output is re-computed to reflect the new inputs. A molecular sensor on liposomal membrane. A switching system for molecular motor.